RANGOON — As the deadline closes for political parties to finalize their candidate lists, those disclosed reveal a staggering gender imbalance despite promises that women’s empowerment would be prioritized in this year’s polls. The Irrawaddy followed up with a number of parties that had declared their commitment to increasing women’s candidacy, finding that several of them failed to meet the mark. When we asked why, some answers were downright shocking. Describing women as “useless,” Kyaw Swar Soe, who heads the Myanmar Farmers’ Development Party (MFDP), invoked the Burmese phrase saoq thone ma kya bu, an offensive term used to convey severe incompetence. Despite the chairman’s abrasive comments, the party’s record on women’s empowerment is markedly better than that of many of its adversaries. Of the party’s some 400 candidates, about 50 of them are women—roughly 12.5 percent. Believe it or not, that’s pretty high. The MFDP is also one of only a handful of parties to appoint women to senior roles. Responding to her colleague’s remarks, General Secretary Khin Than Oo told The Irrawaddy that the chairman “is an outspoken man,” insisting that he and the party supported women’s empowerment. “He said that with frustration arising from sympathy,” she explained, as when a parent is upset by a child’s failure. Khin Than Oo said the party encourages women to participate, but they are often too timid or inexperienced to take part in public processes. The explanation that there simply are not enough qualified women coming forward as candidates is one that The Irrawaddy heard from almost every party. Even the main opposition party, the National League for Democracy (NLD)—which is chaired by perhaps the most influential woman in Burma, Aung San Suu Kyi—put the onus on women to even things out. The party fared worse in gender parity than several of its competitors. It also showed a stark decline in its ratio of female contenders. In a 2012 by-election, women accounted for a full 30 percent of the party’s races, landing 13 of them in the national Parliament. This time around, the NLD boasts about 15 percent female candidacy, slashing that ratio in half. While the NLD is currently the standard-bearer for women’s empowerment in Burma—having put the highest ratio of women in actual positions of political power—it has received criticism of late for turning its back on sitting divisional lawmaker Nyo Nyo Thin, who is, coincidentally, a highly educated and politically experienced woman with existing ties to the party. 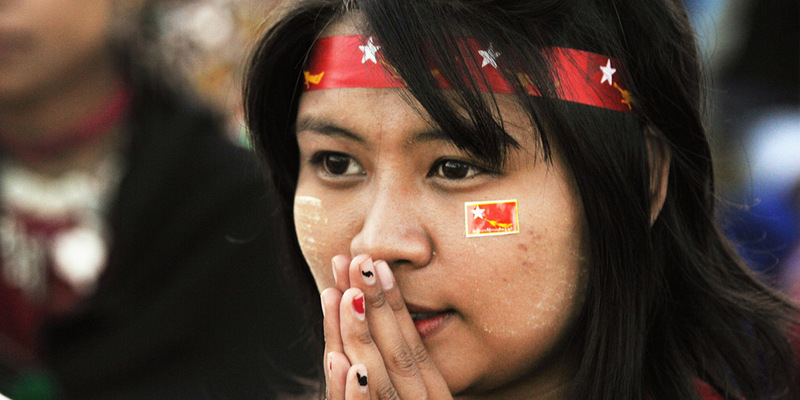 A woman at a rally for constitutional reform held by Aung San Suu Kyi in Loikaw, Karenni State, November 2014. Burma’s 664-seat bicameral Union Parliament has the lowest ratio of female representatives in the region at about five percent. The numbers are even worse at the state and divisional level, where women account for less than four percent of lawmakers. In instances of such extreme imbalance some countries opt for affirmative action, but Burma does not have any legislative tools to address the issue. In February, however, a number of parties told The Irrawaddy that they had adopted voluntary policies to increase candidacy—one of the key steps to achieving more representation—though women’s rights advocates argued that those policies did not go far enough because women still struggle to win elections despite dramatically increased candidacy. Advocates typically rally around a figure of 30 percent as the desired amount of elected representation. The National Democratic Force (NDF) did achieve its goal of nominating women as 20 percent of its candidates, though most parties chose far fewer. A spokesman for the Wa Democratic Party told The Irrawaddy last month that it did not intend to field any women at all. Another grave offender turned out to be the military-backed Union Solidarity and Development Party (USDP), which currently occupies majority seats in the legislature. Of 1,147 candidates, the USDP fielded only 72 women—6.2 percent. The National Unity Party (NUP) told The Irrawaddy it would consider one woman as a candidate for each seat it contests. Maybe it did, but very few of them were nominated. The NUP ended up with about 79 women of 756 candidates, 10.4 percent. While two parties—the Woman’s Party (Mon) and the Wun Thar Nu Democratic Party—are mostly comprised of women, they couldn’t possibly pick up the slack. The former, which was subjected to a series of administrative hiccups and met opposition from local ethnic politicians, ended up registering only four candidates. The latter, founded by former NLD members who supported participation in a 2010 general election that was boycotted by Suu Kyi’s party, will run 18 women in 20 races. But according to educator Khin Ma Ma Myo, who trains women candidates in public policy, it’s been a long, slow climb to the bottom. While parties are including more women as members, they tend to be relegated to what she calls “supportive” roles, which women are often willing to accept. In this sense, she said, bringing more women into political parties is a win-win for men in power; not only does it make them appear progressive, but it also gives them a convenient channel for offloading undesirable tasks. Additional reporting contributed by Feliz Solomon. Top Photo - (Reuters) Burma’s pro-democracy leader Aung San Suu Kyi, wearing her trademark flowers in her hair, arrives for a session of parliament in Naypyidaw April 3, 2015.